Keep lit candles away from items that can easily catch fire and in the path of a draft, which can carry the flame. Place lit candles on a heat resistant surface, in sturdy holders. Make sure candle holders are non-combustible and are big enough to hold the wax. Keep all matches and lighters up high and out of sight and out of reach of your child, preferably in a locked cabinet. Put out the flame when leaving the room or going to sleep. The best way to extinguish a candle is to use a candlesnuffer. The temperature of the glass panels in front of the fireplace can get very hot and cause severe burns within seconds of contact. After the fire is turned off, the glass panels can stay very hot for up to 45 minutes. Keep your child away from the fireplace and never leave your child unattended. 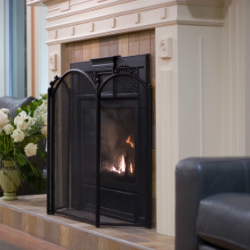 Install a safety screen or hearth gate in front of the fireplace glass panels.